Published: April 28, 2011 at 04:25 p.m. The Falcons' playoff loss to the Packers appears to have given Atlanta motivation to add another young playmaker. I know Falcons general manager Thomas Dimitroff and coach Mike Smith pretty well and I know how much they covet draft picks. So if they're willing to do something as radical as moving up into the top seven picks, as they are reportedly attempting to do, it would be out of the norm. I also know that there were some unhappy people in the Falcons building when they got thumped by Green Bay in the playoffs and that the team had more flaws than their 13-3 record showed. 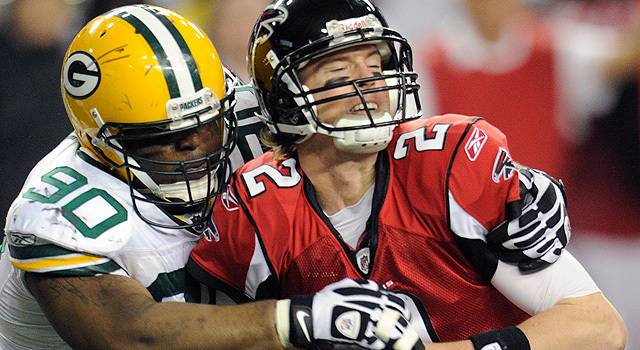 NFL Network analyst Jay Glazer reported Thursday morning that the Falcons are trying to move from their perch at No. 27 in the first round and into the top seven to get a shot at wide receivers A.J. Green and Julio Jones or cornerback Patrick Peterson. This is a highly aggressive move that, in the end, might be too prohibitive. It would cost the Falcons not only their first-rounder this season but probably a second- and/or third-rounder and future picks. The cash investment could be hefty, too, if a rookie-wage scale isn't enacted. If that is the thought around the league, they likely won't have a shortage of top-10 trading partners, as NFL Network's Jason La Canfora reported Thursday. That the Falcons are even considering such a blockbuster move signals they feel they're only a player or two away from a Super Bowl run and that the player is a dynamic talent, a difference-maker. It's also a player they could groom for bigger things in years to come as the nucleus of this team remains young. They want to fix things and they want playmakers. At the same time, Dimitroff and Smith aren't big-splash guys; they also tend to "stick to the process," as they like to say, instead of forcing things. That's why such a huge sacrifice to land a rookie seems out of character. Even so, I do know those are the type of players they seek, and if this is the best means to get their guy, Dimitroff and Smith are also cut-throat enough that they would do just about anything to make things better. Since they were beaten by Green Bay in the playoffs, the Falcons have made no bones about finding explosive players. Green, Jones and Peterson define explosive. Their interest in moving up for one of those prospects probably speaks to Dimitroff's feelings about the lack of impact players at the back end of the first round as well as in free agency, whenever that begins. Unless Atlanta can get up to No. 4, where the Bengals pick, Green might not be available. Peterson could fall to five but the Bills could also take him at No. 3. On the other hand, Jones might still be available at No. 12, a spot the Falcons wouldn't have to sacrifice as much in terms of draft-pick compensation. Adding Jones or Green to a receiving corps featuring Roddy White and Tony Gonzalez is frightening on paper. Putting Peterson opposite Dunta Robinson also could give the Falcons much-needed back-end help on defense. In fact, that's a greater need than adding a top-end wide receiver to a unit that has decent players in Michael Jenkins and Harry Douglas, although any acquisition of Jones or Green would be an upgrade and could signal the end for one of the two in Atlanta. In the end, I'm not sure such a huge deal happens, but the fact that Atlanta could consider such an aggressive trade shows, once again, that the organization will do what it takes to compete for a Super Bowl title every year.